NO all-night drinking sessions with Neil Young or The Prodigy backstage at the Big Day Out. No patting of kangaroos or petting of koalas on a day-off visit to a wildlife park. No outrageous boat cruise replete with supermodels and litres of French bubbles. 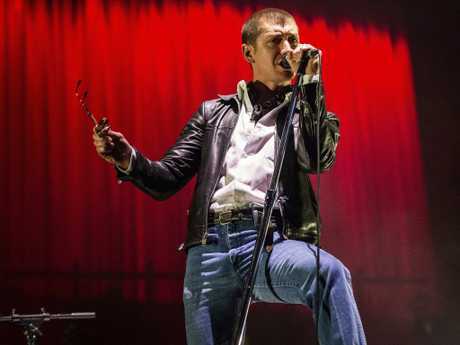 Ask Arctic Monkeys frontman Alex Turner for his fondest memory of the British band's various tours to Australia over the past 12 years and he divulges the most unrock'n'roll recollection. 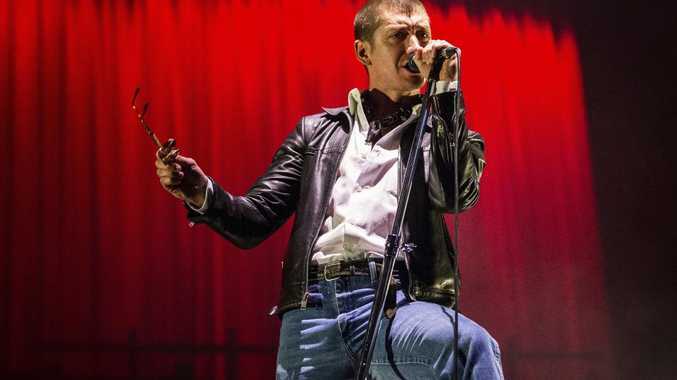 Alex Turner of Arctic Monkeys gets his swagger on. Picture: Amy Harris/Invision/AP. "I don't think I've never had anything but a really good time every time we come down there," he says after many seconds of deliberation. "I think we played golf on one trip to Australia (in 2014) and I don't play that often. I remember doing a very good bunker shot. A friend of mine was filming this bunker shot and it ended up like James Bond. "I don't know if Bond plays golf but if he did, his bunker shots would look like mine." The Arctic Monkeys return to Australia, and perhaps our golf courses, in February next year with their world tour in support of their sixth studio record, Tranquility Base Hotel and Casino. The band's first record in five years, it debuted at No. 1 on the ARIA charts here when it was released in May. 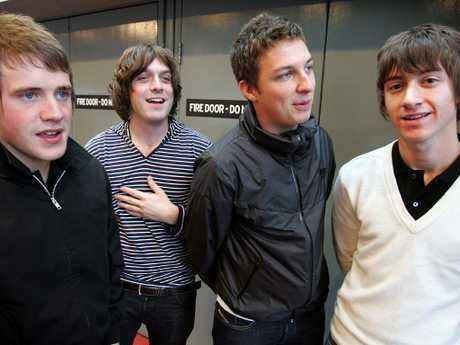 While it opens with the lyric "I just wanted to be one of The Strokes" from first track Star Treatment, the album was a dramatic reinvention of the Arctic Monkeys as stylish lounge and space pop protagonist. It was more Bowie meets Tame Impala than The Stones meets Queens of the Stone Age vibe of their previous record A.M. It sounds like the same creative ambitions were at work in Turner that spurred Daniel Johns to hammer the nail in Silverchair's rock coffin with their final album Young Modern. Listening to its piano and bass-driven jazzy, psychedelic musical soup begs the question of how the hell do the Arctic Monkeys fit their breakthrough hit I Bet You Look Good On The Dancefloor or their previous record's offerings including Arabella, One For The Road and Do I Wanna Know into the band of now? Turner said Tranquility Base is his new normal, where his voice and artistic persona feel most comfortable. But don't freak out; they still play the old stuff. "When I'm playing the new songs, I'm at my most comfortable, I think," he says. "They are in the right range for me right now, and I mean that literally, with my singing voice. But also beyond that, deeper than that, if you allow me to be so bold, this is where we are now." The sonic ambitions of the Arctic Monkeys aren't the only things that have changed for Turner and his bandmates Matt Helders, Jamie Cook and Nick O'Malley since their 2006 debut album Whatever People Say I Am, That's What I'm Not hit No. 1 in the UK and Australia. On their first Australian tour in 2006, which sold out in mere minutes, they played a frenetic 45 minute set, Turner's strumming arm moving so fast you feared it might fly off into the screaming, sweaty audience. Now, the frontman is more of a performer with swagger and groove, a showman albeit one who still appears reluctant to command the spotlight. The cheeky lads look all grown-up now. Jamie Cook, Nick O'Malley, Matt Helders and Alex Turner in Sydney in 2007. Picture: News Corp Australia. "You've got to think of something if you are going to (keep doing) it, if you're going to tell that joke that many times. You have to think of a new way to move your body," Turner says about his onstage vibe. "It also has something to do with the passage of 12 years of time, it was a gradual thing but I know where you're coming from about (my performance). "It is very different to the way it was in the theatres of Australia back then where I was probably clinging on for dear life. Which I still feel now, probably more so on some nights." But truth be told, Turner isn't a live guy unlike many of his rock mates including Queens of the Stone Age frontman Josh Homme who co-produced their 2009 record Humbug. Playing the showman, embracing some kind of inner rock god meets lounge prince, isn't his preferred role. 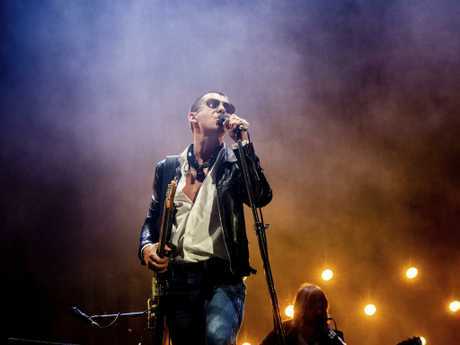 Alex Turner wears his sunglasses at night. Picture: Amy Harris/Invision/AP. "I probably don't enjoy it as much as it looks like I do," Turner says. "I think as time has gone on, if I'm being honest, I enjoy the studio side of it more than touring. I'm not one of those people that it comes naturally to and I know some of them people who are born performers. "I'm not really selling the show, am I? Obviously I don't dislike it; it's a performance, isn't it?" Rod Laver Arena, Melbourne on February 26 and 27, Qudos Bank Arena, Sydney on March 1 and 2 and Brisbane Entertainment Centre on March 3.